Construct buildings on your floating island, breed powerful dragons, hatch their eggs and create new dragon types to fight with in PVP battles; Kinderdragons offers a colourful MMO that is free to play with Facebook and suitable for all age ranges. 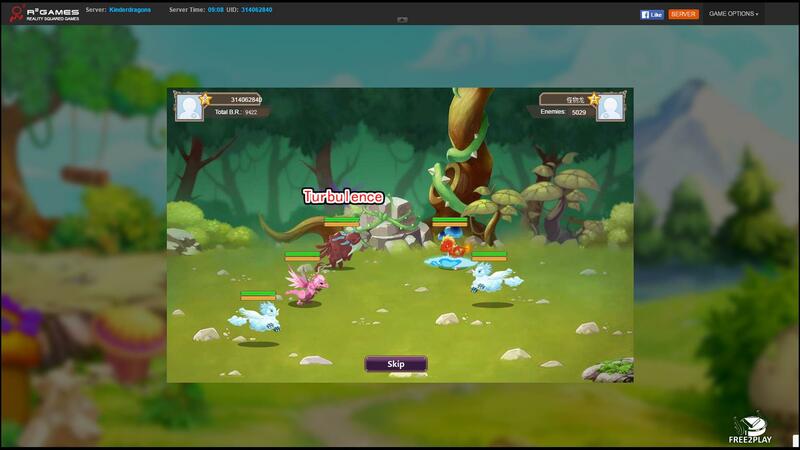 The main premise of Kinderdragons, and the focus for players, is trying to access as many dragon types as possible and make them powerful so that they can fight in PVP battles against other players and earn rewards in the process. 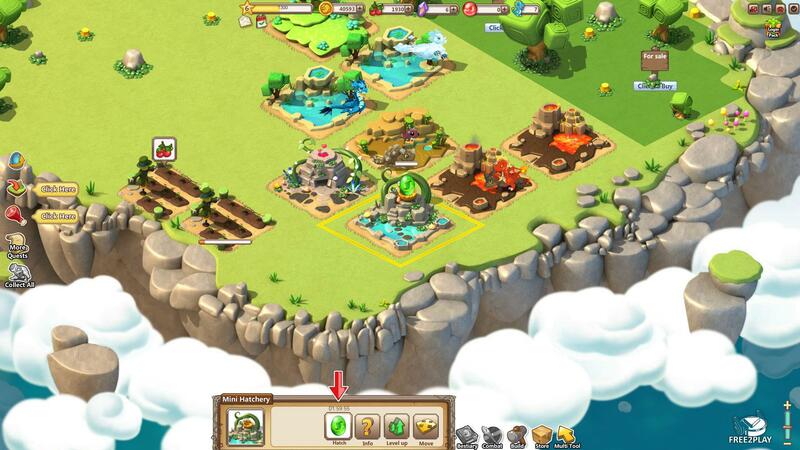 The typical gameplay revolves around a cycle of constructing buildings, breeding new dragons, growing crops to feed them and help them grow, and expanding your buildable land to construct more buildings, breed more dragons, and so on. 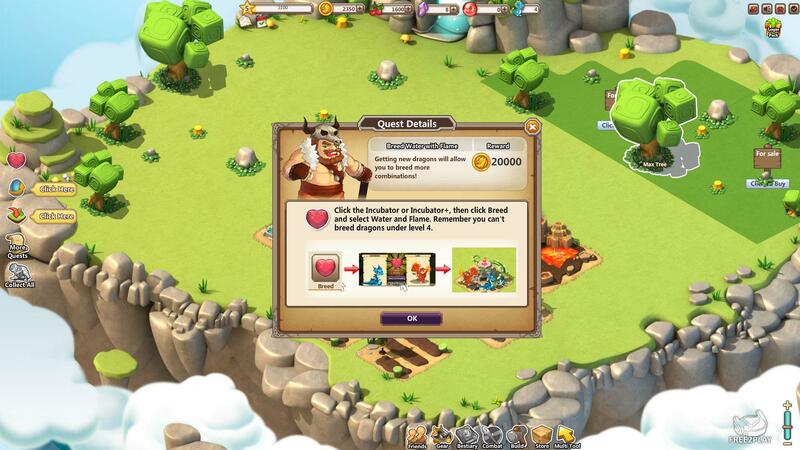 Items and upgrades are purchased with Gold currency, earned from the dragons themselves, with many different purchases available in the shop. The shop also promotes premium purchases using Gems, which can be earned each time a player levels up, through PVP matches or buying them with real world currency. One of the more common uses for Gems is to speed up production/tasks to instantly complete them; everything from growing crops, breeding two dragons, constructing buildings and hatching an egg can take minutes or hours to complete and so Gems offer a quick alternative to getting a task done. The Dragons come in different types which determine their look, the type of nest they need, their skills and also which other dragon types they are strong and weak against. 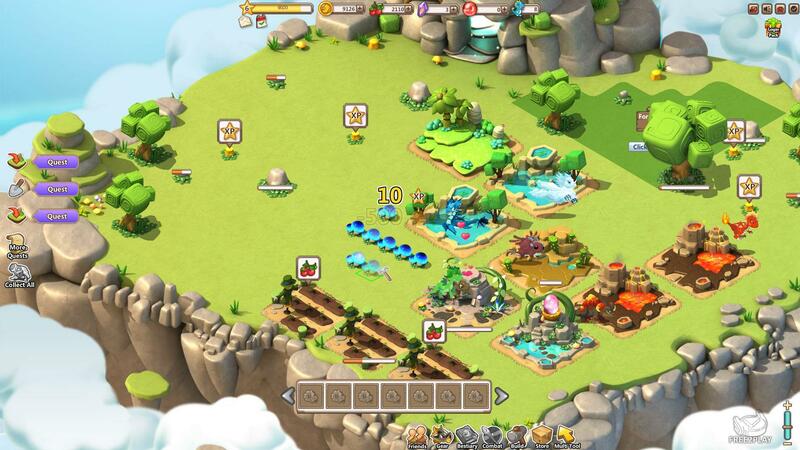 The main four dragons are Water, Fire, Plant and Rock, and players can purchase their eggs for Gold in the store. When these dragons are bred in the Incubator building players are able to make different combinations that will yield a new type of dragon, such as combining Water and Earth dragons create a Mud dragon egg, or Water and Fire dragons create a Cloud dragon egg. Once the egg has been laid then it is moved to a Hatchery building where it can be left to grow and ultimately hatch into a new baby dragon; once a nest matching the dragons' type has been created players can move their dragon there. All dragons can be upgraded by feeding them, this requires a player to construct a farmland and grow then harvest the food to give the dragon XP. The more dragons a player has then the more nests they will need and more food, which means more farms; all of these take up space and so players must manage their plot of land and save currency to ultimately expand out and get more land as well as access to new islands. PVP plays an important role in the game as players are constantly aiming towards improving the strength of their dragons, either by levelling them up with food to improve their stats and skills, or by unlocking Gear items and equipping them to their creatures. There are a variety of level locked Combat events that can be played, many having a time limit in between attempts, and players can earn new items, currency, Gems and more from their victories. When having a Combat encounter players choose which of their dragons they wish to fight with and then head into an instanced battle, the combat happens automatically with no involvement of the player; the main strategy being levelling up your dragon, choosing the right gear, and pairing it up with other dragons to make a powerful team.